FIREPOWER AUDIO USB/FireWire audio interfaces are the ideal way to stream audio to and from your PC or Mac computer. These handy interfaces feature state-of-the-art MIDAS designed mic preamps, legendary the world over for their pristine clarity and high-headroom sonic performance, plus our 24-Bit/96 kHz A/D-D/A converters will really respect your input. Both interfaces support Windows XP/Vista/7 plus Mac OS X and provide onboard phantom power for use with studio-grade condenser microphones. Hook up to the BEHRINGER FCA Series and instantly turn your computer into a powerful recording/editing workstation. Due to its small size and low-latency operation, 6 In / 10 Out architecture, plus 2 highly-acclaimed MIDAS designed mic preamps, the FCA610 is a dream come true for traveling musicians who record and edit on their laptops. The portable FCA610 can receive power from your computer's 6-pin FireWire bus or via the included external power supply. Built-in MIDI I/O allows you to connect keyboards and other outboard MIDI hardware. All standard I/O formats are supported including analog and S/PDIF (both coaxial and optical). The half-rack-space FCA610 stows easily in your travel kit. Because you’ll want to take full advantage of your computer's recording, editing and podcasting potential, we’ve put together a massive software download at www.behringer.com that includes Audacity (the most popular open source audio editor), Podifier, Juice, Podnova and Golden Ear (a great selection of podcasting software). You’re ready to go live on your PC or Mac right out of the box! You also get more than 100 virtual instruments and 50 FX plug-ins, turning your computer into a complete home-based or mobile recording studio. 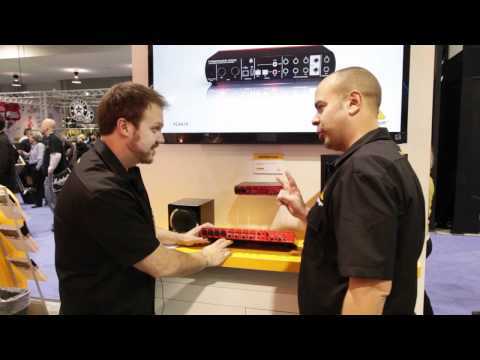 Stop by your authorized BEHRINGER dealer today and join the digital revolution. With our super-affordable FIREPOWER FCA Series FireWire/USB audio interfaces, you’ll get blazing-fast streaming to and from your computer, plus our amazingly sweet MIDAS designed mic preamps, and much more—and we cover you with a comprehensive warranty program. TRACKTION 4 puts the fun back into the creative process, so we're including it free of charge with select BEHRINGER products. This powerful , yet easy-to-use music production software is unlike anything your've seen before, putting everything you'll need on your desktop, on a single-screen - without the sea of drop down and hidden menus common to most other DAWs. And TRACTION doesn't limit the number of tracks you can recored, or the number of effects you can use. In fact, the only limitation is your Mac or PC computers's processing power. Recording and editing couldn't be easier; simply drag, drop, cut, copy or past. Once your magnum opus is finished, share it with others "Tracktioneers" so they can listen, collaborate and edit.